Although it’s an unexpected base for fine jewelry, don’t overlook wood. Artisans elevate the humble material with fine craftsmanship, precious metals and, of course, diamonds. Brazilian designer Silvia Furmanovich specializes in marquetry, creating incredibly detailed jewelry and clutches from tiny pieces of hand-cut and hand-painted wood. Her cherry blossom earrings showcase the precision of her work. Antonia Miletto loves to feature unusual materials such as wood and resin in her one-of-a-kind pieces, which she designs in her Venice boutique. Fred Leighton may be best known for its fabulous estate jewelry, but we love its modern collection too, which infuses pieces with a slight vintage feel. This rosewood-and-diamond bangle has matching earrings. 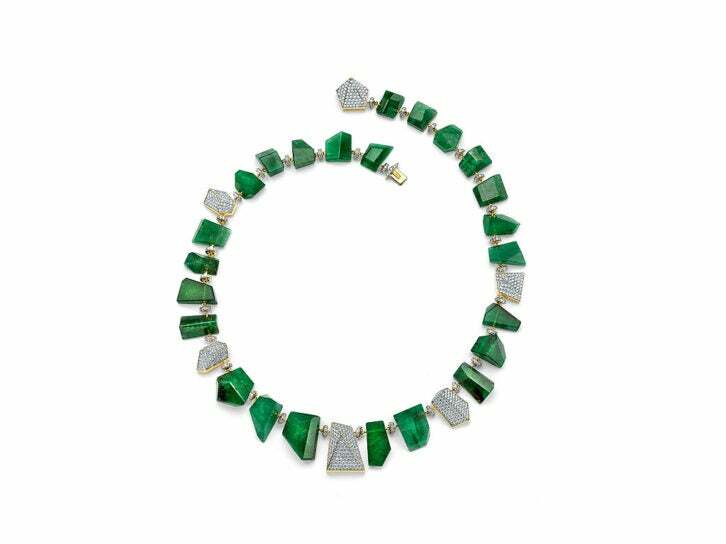 Pieces from fourth-generation family jewelers Hemmerle are instantly recognizable due to their distinctive modern style, which collectors know are created with traditional Austrian techniques. Hemmerle also loves unique materials—it’s not unusual to see showstopping jewels set in copper or bronze—and these wood earrings topped with reverse-set brown diamonds perfectly encapsulate its design ethos. Seaman Schepps caused stir in the early 1900s with his unique modern jewelry. The company today carries on his legacy using thousands of his drawings and molds. The collections include many bead necklaces, among them the rosewood-and-walnut version shown.